Let us handle your individual & business tax needs! At tax time, you want someone dependable, accredited and loyal. 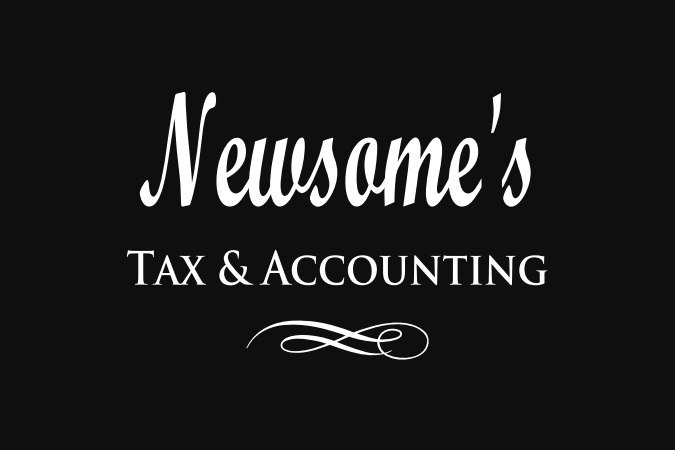 You can find these qualities and more here, at Newsome's Tax & Accounting! We offer referral fees and repeat customer discounts to all our tax clients along with a being available to you all year, not just during tax season because we know what a value that is to our clients. We can handle your individual taxes from estimated tax payments to completing the return, show you how to get the best refund or setting up payment arrangements it needed and if that is the case, we will also show you how to keep from owing the next year. Of course we do business tax returns from Sole Propritorships, Partnerships, Limited Liability Companies, & Corporations. If you need help with Sales Tax & Payroll Taxes, then we really are the right fit for you! Come see us and let us help you grow your business. Have you failed to get your past return or returns filled? We understand things happen and we are here to help. We can file your past years tax returns and even help you get your paperwork together. Do you owe on past taxes? Again, we can help you set up payment arrangements. Make an appointment to come see us, I promise you we can help you with as little pain as possible! Estimated tax is the method used to pay tax on income that is not subject to withholding. This includes income from self-employment, interest, dividends, alimony, and rent, gains from the sale of assets, prizes, and awards. You also may have to pay estimated tax if the amount of income tax being withheld from your salary, pension, or other income is not enough. Use form 1040-ES, see due dates below. If the due date falls on a weekend or holiday, return is due next business day.